The focus of the piece is the decision from somewhere in the chain of command to cancel Delta's planned attack on bin Laden. Who knows, there may have been good reasons. Perhaps the information about bin Laden's location wasn't as completely solid. Maybe there were fears about extracting the Delta team, once angry Al Qaeda fighters started hunting for bin Laden's killers. Or maybe the reasons were bad. Nevertheless, it's worth remembering this small piece of the much bigger history of American counterterrorism--especially when we need to judge other risky missions that we assign to special operations forces (SOFs) like Delta. Not every decision to pull the plug is an outrage--as long as there's continued effort to reach the same objective. Special operations forces (SOFs) succeed when they achieve "relative superiority" quickly. As a corollary, the longer it takes to achieve relative superiority, the greater the risk of friction (in the Clausewitzian sense) gumming up the works. As another corollary, SOFs don't need to get 100% marks in every aspect to succeed. The combination needed to achieve relative superiority in a particular operation is what's important. Consequently, as elite as they may be, SOFs are best suited to particular missions that have a focused target and short duration. That's the first chapter, in a nutshell. The rest of the book uses eight case studies to test the hypothesis. Some of the case studies, such as the raid on Saint-Nazaire and the hostage rescue at Entebbe, are well-known. Others, like the Italian frogmen who infiltrated Alexandria harbor to sink British warships, are far less famous. All should provide good tests of McRaven's hypothesis. At the end of each case study, McRaven asks how well did the SOFs in question achieve relative superiority through the six factors (simplicity, etc.) he argues are the critical factors. McRaven is willing to admit when the theory might not fit the facts: for example, the Americans who rescued POWs in the Japanese prison camp at Cabanatuan did not have time to rehearse the operation, calling into question the "repetition" part of the theory. To his credit, McRaven doesn't try to gloss over where the theory may not work (though he does adjust it somewhat in the concluding section). Someone involved in special operations for a living can use McRaven's ideas as a scorecard for any planned mission. How fast are we going to achieve relative superiority? How well does the operation rate on the measures of simplicity, security, repetition, surprise, speed, and purpose? Are the mission objectives limited enough so that we can use these elements to our advantage, and then get the hell out of Dodge? Citizens can use McRaven's book to better understand what the SOFs do well, and by extension, what they're not well suited to do. SOFs are trained and equipped, as elite forces, to excel at tasks like rescuing hostages, sabotaging warships, and gathering intelligence. They are not, despite their elite status, capable of taking and holding terrain in the fashion of their less elite but better-suited infantry counterparts. For example, when even smaller armored vehicles appear on the battlefield, as they did in the St. Nazaire raid and the Grenada invasion, SOFs may lack the anti-tank firepower to deal with them. Since they're traveling with as little equipment as possible, to maximize their speed in reaching objectives, SOFs can't linger alone at the objective while enemy forces mass to counterattack. 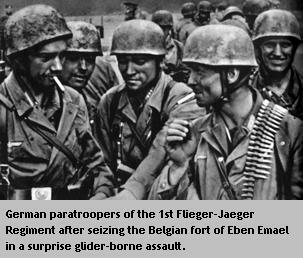 The only reason that the German glider troops that attacked the Belgian fortress of Eben Emael succeeded was that the rest of the Wehrmacht was hurrying to reinforce them. We often hear the phrase "heroes" to describe American troops in Afghanistan and Iraq. While we want to give credit to the bravery and ingenuity of soldiers, we don't want to expect too much of them, whether they are veteran elite forces or reservists just called up for duty. McRaven's book dispels much of the confusion generated by the mystique of special operations forces. We should treat the phrase "heroes" with the same skepticism, when it implies asking American soldiers to do too much for too long, in missions for which they were never suited in the first place. A book I picked up during my recent trip to DC, Derek Leebaert's To Dare And To Conquer, is a prime illustration of the difference between useless and useful forms of military history. For someone like me, Leebaert's book was irresistible. A broad historical survey, from ancient to modern times, of special operations? I'm there! Unfortunately, Leebaert doesn't deliver what he promises. Reading this book, you might get a feel for some important elements of special operations. However, you have to wade through a swamp of muddy ideas and vague historical allusions. When you finally arrive at the book's ill-defined destination, you won't find much of substance there. Leebaert undercuts his own argument almost from the beginning. It's clear that he knows that special operations are different, just as special operations forces (SOFs) are different from other units. For example, he observes that conventional military leaders have a love-hate relationship with SOFs. Given their elite status, SOFs often appear as the tool for every tough job, when in fact they're best suited for a particular set of tough jobs. Small, mobile, creative units may be good at raids, rescues, and psychological warfare, but they're not the right forces for taking and holding every well-defended position. Leebaert has obviously read a creditable number of books about special operations, to reach this kind of insight. However, he doesn't share the benefit of his scholarship with his own readers. His "theory" of special operations is a muddle of characteristics ("picked men") and principles (the element of surprise) that could apply to a lot more than just the SOFs. When his book moves from special operators to special operations, Leebaert gets even more confusing. Special operations encompass tactical and operational techniques that, over time, increasingly became the province of a specialized kind of military unit. Leebaert correctly cites this trend, but makes it unclear what these specialized units are doing that makes them different. Not every instance of surprise is special operations. Therefore, it's pointless for Leebaert to cite Hannibal's victory at Lake Trasimine, when a hidden detachment of Carthaginians helped surround and destroy a Roman army, as an instance of "special operations." Nor does every attempt to play on the fears of the enemy qualify as a "special operation." Soviet soldiers infiltrating behind German lines to confuse, harass, and terrify the enemy achieved the same results as, years earlier, the Nazi armored spearheads. What makes one operation "special," and the other not? Without a clear, precise definition of special operations undergirding it, Leebaert's book devolves into a mishmash of historical anecdotes. However, even these bits of information are allusions, not full accounts of operations like the raid on the Tirpitz. You'll have to go elsewhere for these case studies. Why, then, would you read To Dare And To Conquer? Good question. It provides neither a carefully-delineated theory of special operations, nor illustrative examples of this theory put into practice. For a stark contrast with Leebaert, check out William McRaven's Spec Ops. McRaven's prose may be less arty than Leebaert's, but he has a lot more useful information to convey. Spec Ops starts with a simple, clear definition of special operations. Here's how they achieve specific military objectives in a particular way. You might have to puzzle over his diagrams, but after a couple of tries, they make sense. For example, his "inverted pyramid" of special operations--planning at the bottom; security and repetition in the middle; surprise, speed, and purpose at the top--is really a cone of events, radiating from planning through execution. The rest of his book provides eight case studies, from the daring German glider attack on the Belgian fortress of Eben Emael, to the Israeli rescue raid at Entebbe. Each case study provides enough information that you actually learn something about the event, if you're not already familiar with it. Even if you're already an expert on, say, the British raid on the Nazi-held port at Saint-Nazaire, you get McRaven's analysis applied to this operation. Here's where the operation followed the theory of special operations; here's where it didn't. Here's why it succeeded; here's why it failed. This approach makes McRaven's book useful to a variety of audiences. Military planners can use it to re-think the doctrine that goes into training and manuals. Military historians can better understand the reasons why one side won, and the other side lost. An interested public can better appreciate when the nation should contemplate sending its "picked men" into combat, and when it shouldn't. Now that's a book worth reading.